Being able to produce chicken meat is an important milestone for aspiring urban farmers. If you believe, as many nutritionists suggest, that we are what we eat, you’ll realise that the big benefit in rearing your own is that you’ll be eating the cleanest and freshest chicken that you have ever had. Just seven days old – trebled in size. Producing broilers (meat chickens) is a project that will (assuming reasonable management), take up to 8 weeks to conduct. The precise time will depend on how big you want your chickens and what you intend to feed them. 14 days old and eating like crazy. Don’t confuse the term broiler with boiler. The broiler is a 5 – 8 week old tender frying chicken while the boiler is a retired layer or breeder that is likely to be at least 18 months old. Both are useful sources of food but they are prepared in very different ways. Broilers are what you get when you order chicken and chips (fries) from your local fast food outlet. You can begin harvesting your chickens from about 24 days onwards. 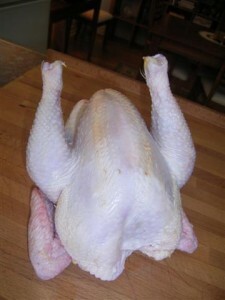 Chickens at this age are referred to as Poussins and they make an excellent single-serve dish. 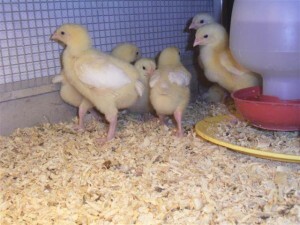 At six weeks of age, your chickens will dress out at about 1.5kg or better. If you keep them for up to ten weeks, you’ll get very large chickens indeed. The important thing to take out of this article are that you can produce clean fresh chicken meat in your own backyard. 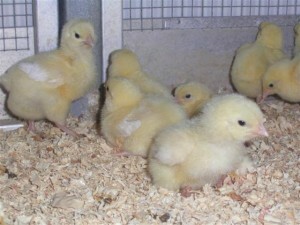 where can I purchase day old broilers in SE NSW? What is your experience with pigeons/doves. As a boy growing up in Sydney lots of the Christian Arabic community in my area had dovecots. Both for birds and eggs as well as fertiliser. Most had pigeons but others specialised in Ring neck doves as they were supposedly more selective in their eating habits. A very small number wanted the native Top-notch dove. From what I remember, they rarely supplied suplimental feed. I’ve read of massive dovecots in Iran that cover an acre or more. I do remember tiny matchstick sized drumsticks covered in honey and sweet spices – wonderful! Tumudi……while hybrid vigour may be a feature of certain poultry outcrosses it certainly won’t apply in every situation. I suggest that you consult local poultry extension officers (assuming you have such a thing where you live) because they will have a much better understanding of local breeds and conditions. Why if you can mix the one of the exotic cockerel (cornish) with the African indigenous breed (pedi) it doesn’t come up with the new hardy breed? hi, i was wanting to know the most humane and quickest way to kill the chickens … is holding them upside down by legs and twisting their necks and pulling down at same time .. then cutting off head and hanging them for awhile the best way? how long do you recommend draining them before feathering and gutting? Deborah Christensen……The killing method that brings about death in the shortest possible time is the most humane way, however, when processing birds or animals for meat, there are other imperatives to be considered. The carcase should be thoroughly bled out in the interests of meat quality. Wringing the neck of anything is a questionable way to kill it because it is possible for a novice to botch it (leading to a protracted and painful death) and bleeding out of the carcase may be impaired. The time-honoured backyard method of removing the head of the chicken with an axe is certainly quick and decisive…..and it usually allows for effective bleeding out. The post mortem struggle that occurs when chickens are killed is normal and assists bleeding out. It’s logical that, if the bird has no head, it’s dead. If the wings are left to flap wildly, bruising of the meat is likely to occur. To avoid this, wrap an old shirt around the bird and tie it off to prevent its wings from flapping. The other good reason for restricting the wings has to do with your own personal well-being. A sharp blow to the groin from a flapping wing will cause the colour to drain from your face very quickly. We kill chickens by restraining them in a killing funnel and severing the jugular vein. The bird becomes unconscious very quickly and bleeds out thoroughly. Because the wings are restrained, carcase damage is minimised. 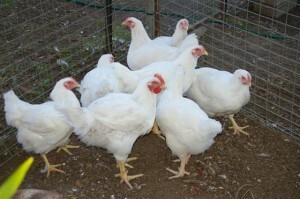 What breed of chickens do you use for your meat chicks? I was going to use Cornish rooster over Plymouth rock hens. Will this produce white skinned broilers? Matt…….we buy hybrids like those that are raised in the big broiler sheds. They have the genetics for rapid growth and we don’t need to worry about whether the cockerels among them will begin to crow before we’ve had a chance to process them (we live in an urban area). I’m not familiar with Cornish chickens but I’d be surprised if that cross produced anything but white-skinned chickens. 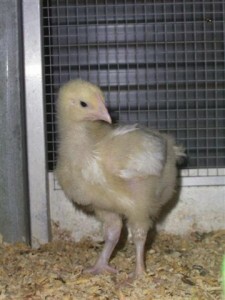 You could breed White Rock chickens – a good utility line would give you reasonable layers and good meat chickens. If you cross Plymouth Rock cockerels some other breeds, you will trigger a feature called auto-sexing…..where the male chicks are one colour (buff) and the females are another (silver or yellow). This is very handy because you can feed the two different sexes differently with the result that the females mature slowly and make good layers and the males get fed so that they grow quickly to become table birds. The only thing better than white-skinned chickens is yellow-skinned ones. Feeding maize to chickens gives their skin a yellowish tinge and meat that tastes second to none.